The removal of an entire section on the Great Barrier Reef from an international report on World Heritage and climate change has been justified by the Australian government because of the impact on tourism. The Guardian reported that all mention of Australia has been removed from the report released on Friday. An Environment Department spokesperson was quoted as saying that “recent experience in Australia had shown that negative commentary about the status of World Heritage properties impacted on tourism”. Australia is the only populated continent that was not mentioned in the report, which was produced by UNESCO, UNEP, and the Union of Concerned Scientists. It comes in the wake of one of the Great Barrier Reef’s most significant coral bleaching events – one widely attributed to climate change. In its purest sense, it could be argued that it is important for the world to know about the impacts climate change is having on some of its most famous natural wonders. This has the potential to precipitate national and global policy change that might ultimately help the reef. It could also be argued that much of the damage to perceptions of people around the world has already been done. The final episode of David Attenborough’s documentary on the Great Barrier Reef – which discusses the widespread bleaching in detail – arguably has far more potential to influence would-be tourists contemplating a visit to the reef. News coverage of the events has reached audiences as far afield as the United States and Britain. 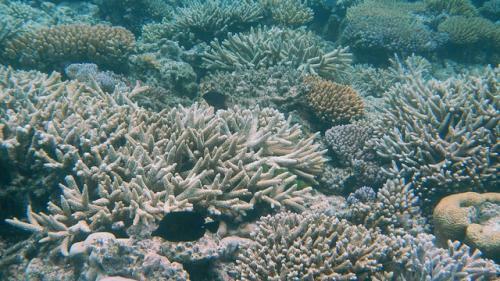 And a recent picture essay on The Conversation provides evidence of the bleaching, observing the phenomenon as “a huge blow to all Australians who cherish this natural wonder and to the tourists who flock here to see the reef”. Given that the issues on the reef are well known and widely covered, would the UNESCO report really have had an impact? The Cairns tourism industry is a vital export earner, not only for the region but for the nation. The region has more than 2.4 million visitors per year, contributing A$3.1 billion to the economy, with the Great Barrier Reef as its anchor attraction. Adding complexity to the issue, there is debate locally as to how widespread the coral bleaching reported by scientists really is. The tourism industry in Cairns has been quick to counter scientists’ claims with its own. Tour operator Quicksilver has responded with Reef Health Updates featuring a marine biologist who claims that as the water cools through winter, many of the coral are likely to regain their colour. Tourists have also been interviewed for the campaign, emerging from the water amazed and astounded at the diversity of colour and marine life they have seen. Regional tourism organisation Tourism Tropical North Queensland has also begun a campaign to showcase undamaged parts of the reef. Tourism is a perception-based activity. Expectations of pristine waters and diverse marine life on a World Heritage-listed reef are what drives the Cairns and North Queensland tourism industry in Australia. We know from past research that perceptions of damage to the natural environment from events such as cyclones do influence travel decisions, but we do not yet know how this translates to coral bleaching events. Researchers in the region are working to collect data from tourists about how their pre-existing perceptions of coral cover and colour match their actual experiences. This will provide evidence of the impacts of the bleaching event on the tourist experience and also shed light on what has shaped tourists’ perceptions prior to visiting. Currently, we only have anecdotal evidence from operators and the tourist interviews in the Quicksilver video on what these impacts really are. What impact could this have on the reef? From another perspective, tourism is particularly valuable to the reef because it is a relatively clean industry that relies on the preservation, rather than depletion, of the resource for its own survival. The Great Barrier Reef is a resource of value to both tourism and other industries. In the past, the reef has narrowly escaped gas mining, oil spill disasters and overfishing, not to mention the ongoing impacts of land-based industries along the coast that drains to it. It is important to remember that the original World Heritage listing was “born out of a 12-year popular struggle to prevent the most wondrous coral reef in the world from being destroyed by uncontrolled mining”. This raises questions about whether the comparative economic importance of mining and other industries could increase if tourism declines. The message about the threats to the Great Barrier Reef is already in the public domain. Research is still being done on the true impact of the bleaching event and associated perceptions on the tourism industry, and the results are not yet conclusive. Rather than bury information that many people globally already have access to, perhaps the Australian government could think more creatively about how it is addressing the issues and promoting this as a positive campaign for “one of the best managed marine areas in the world”.